Bring a large pot of lightly salted water to a boil. Cook egg noodles in boiling water, stirring occasionally until cooked through but firm to the bite, about 5 minutes; drain. Heat a large skillet over medium-high heat and stir in turkey and onion. Cook and stir until turkey mixture is crumbly, evenly browned, and no longer pink, about 10 minutes; drain. Stir in tomato sauce and Italian seasoning; bring to a boil. Reduce heat to low, cover, and simmer for 10 minutes. Combine milk, cream cheese, parsley, and garlic in a small saucepan. Cook and stir over medium heat until cream cheese is melted, about 5 minutes. Toss noodles with cream cheese mixture; transfer to prepared baking dish. Top with turkey mixture and sprinkle with mozzarella cheese. Bake in preheated oven until cheese is melted, 15 to 30 minutes. 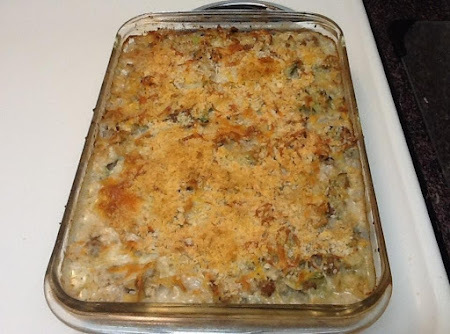 No comments for: "Ground Turkey Noodle Bake Recipe"